I'm pleased to report that Stephanie Shih and Rebecca Starr have done the work for me, and they did a careful job indeed. Here's the summary picture; below the fold, I've included their notes on where the data came from. Comments are open so that people can add their own analyses. We tried to follow the methodology of the original 2009 study, with a few modifications. 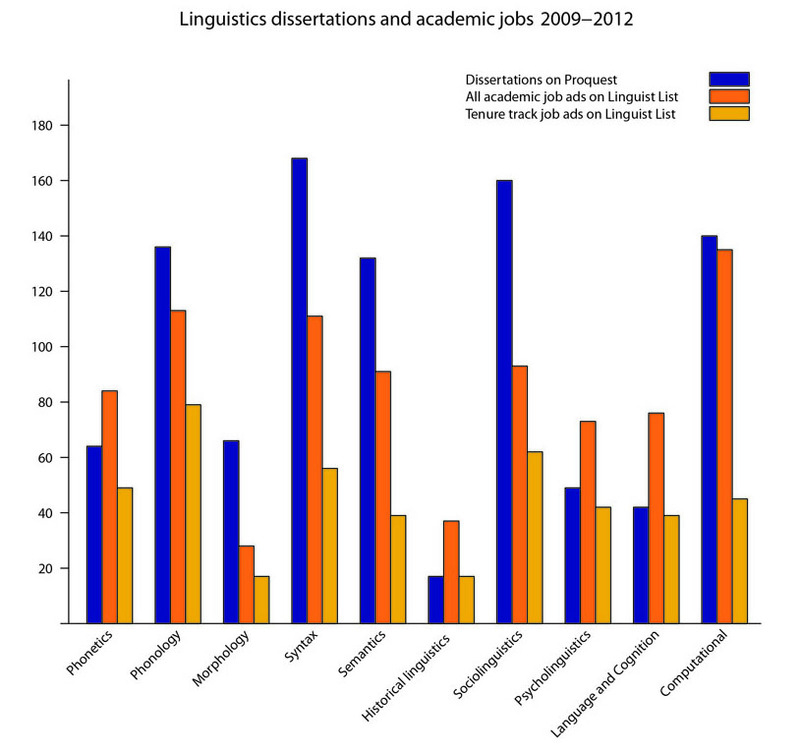 We focused on academic jobs, excluding industry positions because we felt that Linguist List wasn't the most accurate representation of all of the industry jobs available to linguistics graduates. And because we were mostly curious about the ability of academia to absorb the number of PhDs produced. "All academic jobs" includes permanent and temporary (e.g., postdoc, visiting) positions advertised on Linguist List. "Tenure track jobs" includes permanent positions (in the UK, for instance, this would include "Lecturer" positions). We added morphology and historical linguistics as subfields. We excluded the "applied" subfield from this graph because the overall number of jobs listing applied linguistics as their subfield was huge and swamped the rest of the graph, and because the vast majority of those jobs were specific to teaching a particular language, so this number does not relate clearly to number of phds in applied linguistics. One caveat here is that there is probably still overinflation in the job numbers. Many job listings ask for more than one subfield: for example, a "Syntax and Semantics" job was counted once for syntax and once for semantics, too. Furthermore, we made no effort to subcategorize within subfields (e.g., jobs specifically for theoretical syntax, or jobs calling for specific language specialties like Spanish phonology). Well, if you're a corpus linguist, you can gather and analyze the data yourself! These data suggest that the best shot at getting a tenure-track job is for those whose dissertation is on historical linguists. If I'm reading this right, isn't the figure somewhat skewed by the assumption that the relevant applicants for any position all wrote a dissertation that is classified as Linguistics? For computational and psycholinguistics positions many applicants have degrees in Computer Science, Psychology or similar. Language positions in psychology departments are often advertised on LINGUIST list (there isn't a huge number of such positions these days, alas), but the sample size of potential applicants is seriously underestimated. The few such dissertations (on linguistics, not linguists, I think) seem about evenly matched with the few tenure-track positions available. It does not follow that historical linguistics should be viewed as an emerging field where any new scholars will be able to find jobs (unfortunately). The larger demand for non-tenure-track positions probably means that these positions are for filling temporary gaps or for teaching some hist ling in addition to other specialties considered more important.